Edible Canada and Savoury Chef Foods have come together to provide exemplary full service catering services for personal and corporate events. The new joint venture, Edible Canada Catering, draws on the varied and vast culinary experience of Edible Canada founder and president, Chef Eric Pateman; Edible Canada’s Chef de Cuisine,Tom Lee; and Savoury Chef Foods founder and Executive Chef, Taryn Wa. Menu items below are examples of the new Canadian cuisine that Edible Canada Catering will offer. As menus are always customized to the season and client, these dishes are subject to change. 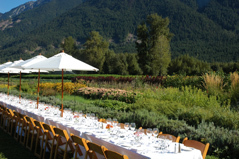 Edible Canada Catering is now accepting clients and booking events for the spring/summer season and beyond. www.ediblecanadacatering.com.